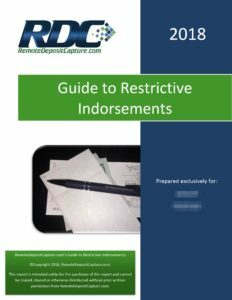 If you already know the difference between “indorsement” and “endorsement,” you’re the kind of professional who will benefit from the newly-released RemoteDepositCapture.com’s Guide to Restrictive Indorsements, available to purchase at their website. The report is authored by John Leekley, founder and CEO of RemoteDepositCapture.com, who is widely regarded as the leading authority on all things RDC. The 6-page report is packed with information relating to the recent updates to Federal Reserve Regulation CC as they relate to indorsement issues and policies. Financial institutions will want to have this information at their fingertips when they choose restrictive indorsement language in the new Reg CC environment. OrboGraph’s position is more like Switzerland! Our new Restrictive Endorsement Validation (yes we spell it endorsement), using AI and Deep Learning, will provide functionality to handle “For Deposit Only” or “For Mobile Deposit Only” as well as mobile check boxes, and do so with incredible accuracy and success rates. However, requiring a financial institution name and validating the financial institution name requires a more customized approach for full automation. The report is a valuable tool and we highly recommend that you check it out. Well done, John!